Move to Byron to automatically trigger his quest. With Andre as your leader, talk twice to Vincent at e9. Move to h7 in Al Quelt Moreza to find an item. Return to Vincent. Move to b8/b9 in Al Quelt Moreza - Nartex to find an item. Return to Vincent. Move to h2 in Al Quelt Moreza - Arcade to find an item. Return to Vincent. Move to g8 in Al Quelt Moreza - Parsonage to find an item. Return to Vincent. Talk to Vincent and give him the Refined Holy Water to receive his character card. Finish Vincent's recruitment quest. You cannot start this quest without doing so. With Vincent as leader, talk to Kurt in Los Toldos. With Vincent as leader, go to d5 in Tierra de Los Muertos, click the wooden board and investigate the 8 altars around it. Click on the wooden board, you will be moved to an instance. With Vincent as leader go to e4 in Tierra de Los Muertos. Talk to Navas at e4 to receive the Abyss Stancebook. 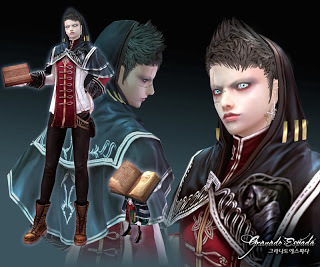 Give Veronif's Diary (33AR Tome) to Navas to receive the Abyss Magic Book (34AR Tome). Vernoif's Diary can be acquired through Veronif as a repeatable quest. Note that Vincent can wield Veronif's Diary too. Repeatable: Give 1x Dragon Heart and 1x Veronif' Diary to Navas for additional Abyss Magic Books.